Over the past few years, Instagram has become a Mecca for online motorcycle content, hosting images and video for every imaginable motorcycle trend. From café racers to scramblers to choppers, whatever you’re searching for is only a hashtag away. Arguably, one of the most popular motorcycle trends on Instagram has been the revival of flat-track racing and the unique machines that dominate the dirt ovals. From backyard tracks documented with cell phone photography to the Springfield Mile with Yve Assad behind the lens, images of flat-track racing have continually increased in popularity across motorcycle communities on social media. 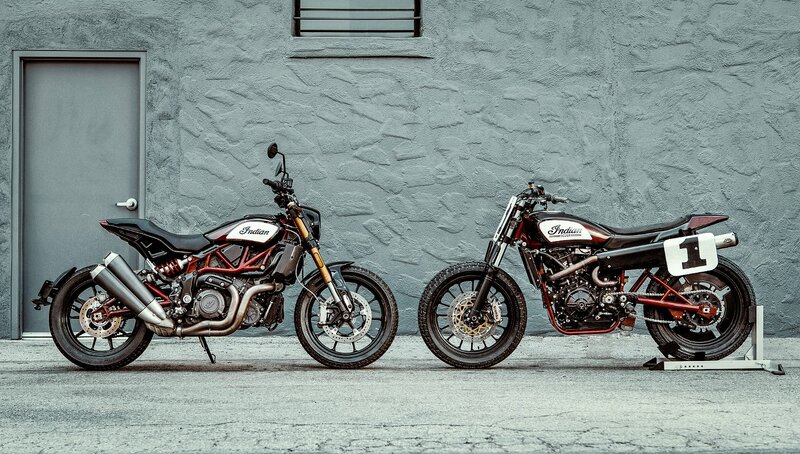 The FTR 1200 and FTR 1200 S are the first OEM options to try to capitalize on the styling craze of the flat-track machines sweeping social media. Indian Motorcycles photo. But unlike café racers, scramblers, and choppers, no manufacturer has yet to try to capitalize on this trend with a street-legal, factory option. That is, until today, when in Cologne, Germany, Indian Motorcycles finally pulled the curtain back on the long-awaited FTR 1200 and FTR 1200 S. A flat-track-inspired, naked sport bike that is poised to introduce a new segment of riders to the American manufacturer. To say that Indian has a history in professional flat-track racing would be an understatement. In the late 1940s and early 1950s, their factory riders, Ernie Beckman, Bill Tuman, and Bobby Hill, earned the nickname “The Wrecking Crew” because of their unstoppable presence on the race track. But then Indian faltered, the marque went out of business, was revived, was sold and sold again. It wasn't until Polaris bought the rights to the legendary brand in 2011 that Indian got back on firm footing. While the factory production bikes were exclusively cruisers aimed at taking a chunk out of Harley-Davidson's sales, there grew a slow but steady marketing push around recapturing the original essence of the brand, which was all about performance. 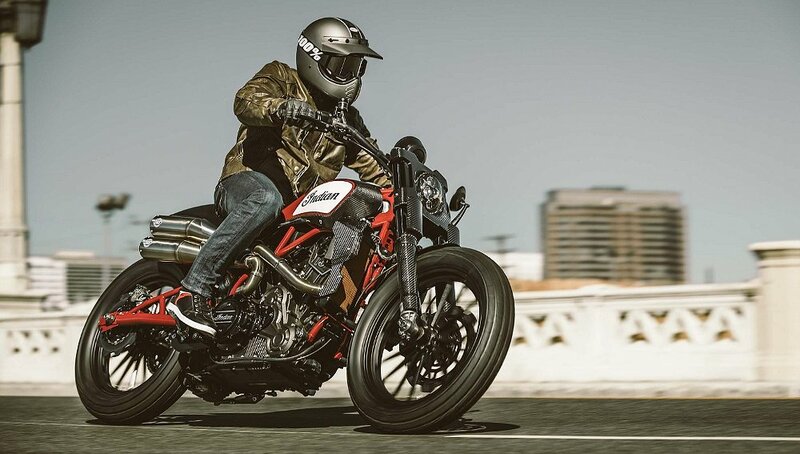 So in 2016 Indian Motorcycles returned to flat-track racing with Bryan Smith, Brad Baker, and Jared Mees racing an all-new Indian Scout FTR 750. With big shoes to fill, the trio set out to claim a new history for the Indian name, as well as earn the right to be called "The Wrecking Crew." With back-to-back championship seasons in 2017 and 2018 and multiple American Flat Track podium sweeps, they achieved a level of dominance the original crew could envy. It only made sense to capitalize on that racing success with a street-legal version of the flat-track machine. It's got retro lines, but it looks like a modern sport naked to me. Indian Motorcycles photo. While the new FTR 1200 and FTR 1200 S are styled after the FTR 750, that’s where the similarities end. 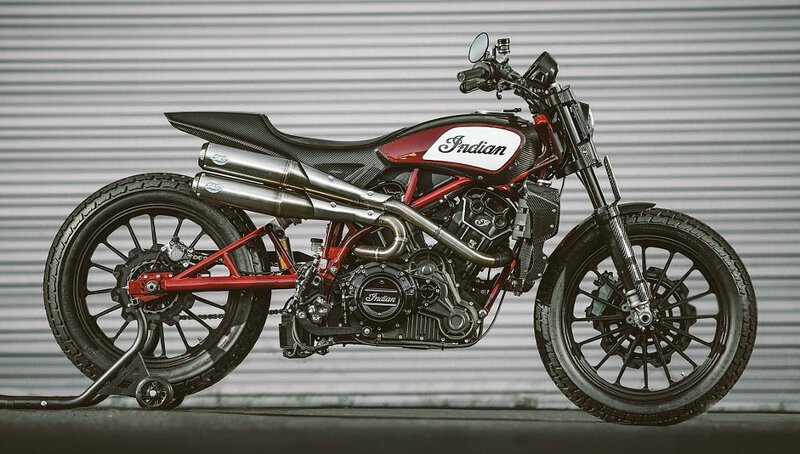 While the look says “flat track,” I feel that the bike itself screams “street-legal, naked sport bike.” And if this thing is as much fun to ride as it is too look at, Indian will have actually delivered on its promise of a high-performance, street-legal machine. To start with, the engine for both the 1200 and the 1200 S is a liquid-cooled, 1203 cc, 60-degree V-twin. With dual overhead cams, four valves per cylinder, and a compression ratio of 12.5:1, this is a very sport-oriented powerplant. Indian claims it makes 120 horsepower at 8,250 rpm and 85 foot-pounds of torque at 6,000 rpm. The engine utilizes a low-inertia crankshaft which Indian says will allow power to spin up rather quickly. It’s then delivered via a six-speed gearbox controlled by a slipper-assist clutch. In order to maximize output, a final 525 chain is used to drive the rear wheel. The DT3-R is designed specifically for this bike and is based on Dunlop's race tire, the DT3. Indian Motorcycles photo. Unlike a true flat-track bike that uses the same size 19-inch wheels at the front and the rear, the new FTR 1200 and 1200 S will utilize more conventional street sizes. Both wheels are cast aluminum with the rear wearing a Dunlop DT3-R, size 150/80R18 tire, while the front will don a 120/70R19. The DT3-R tires are different from Dunlop’s standard DT3 flat-track race tire. The DT3-R was specifically designed for Indian and the FTR models. Unlike the dirt-oriented, race version, the “R” features tread blocks which are closer together and have a shallower depth. The amount of silica was also altered to increase both grip and longevity. If these brakes function as well on the FTR 1200 and FTR 1200 S as they have on other motorcycles I have ridden with them, this bike will slow down real quick. Indian Motorcycles photo. Both models will be slowed using dual, radially mounted, Brembo Monoblock 4.32, four-piston calipers up front and a Brembo P34, two-piston caliper at the rear. ABS will also be standard for both models. Having ridden other motorcycles with a similar setup, I have no doubt that the stopping power on these bikes will be fantastic. Up front, the FTR 1200 is suspended via a 43 mm, inverted cartridge fork with 5.9 inches of travel. Suspension at the rear is handled via a monoshock, also with 5.9 inches of travel and adjustment for preload as well as rebound damping. The amount of travel interests me as it's more than you'd typically find in a sport bike but less than something like an adventure bike. I am extremely interested to see how this bike composes itself. The steel trellis frame is a noticeable departure from the FTR 750. Indian Motorcycles photo. The most noticeable departure from the FTR750 is the use of a steel trellis frame with an aluminum rear subframe. The rear shock connects the frame to the tubular-steel swingarm which is modeled after the FTR750’s. The swingarm pivot connects directly to the engine, a design which Indian claims helps them to reduce the FTR’s overall wheelbase. Even with this consideration the wheelbase measures 60 inches, which is rather long for such a sporty machine. The engineers work to counter that with a sportier steering geometry featuring a rake angle of 26.3 degrees and 5.1 inches of trail. My expectation is that the FTR should be rather stable at high speeds while still relatively sporty in the corners. That being said, the FTR isn’t a lightweight machine. What looks to be the FTR 1200's fuel tank is actually the airbox. Indian Motorcycles photo. With a claimed dry weight of 488 pounds (489 for the “S”), this bike will easily surpass the 500-pound mark by the time fluids are topped off. However, Indian maintains that the new FTR 1200 wears its weight well. The 3.4-gallon fuel tank sits under the seat which helps to centralize the bike’s mass while simultaneously lowering the center of gravity. What looks like a traditional fuel tank is actually the FTR’s airbox. The engine exhales through a two-into-one-into-two exhaust which swings down low on the right side of the bike. For those who don’t like the look of the stock system, there is said to be both low- and high-mount Akrapovic slip-ons available. I am excited to see what the high-mount option looks like because to my eye the exhaust is the most glaring styling miss on this bike, compared to the prototypes we've seen. The base FTR 1200 will feature an MSRP of $12,999, and be available in one color, Thunder Black. Indian Motorcycles photo. The FTR 1200 will feature an MSRP of $12,999, with Thunder Black (aka black) being the only color available in base trim. The FTR 1200 S adds additional features and colors for an additional cost. The first upgrade to the S version is the suspension. The anodized gold fork of the S model is not an Öhlins, but it is fully adjustable for preload, as well as for compression and rebound damping. The rear shock gets a piggyback reservoir (again, don’t let the anodized gold and blue fool you, it’s not Öhlins) as well as the addition of a compression adjuster. The LCD screen and upgraded technology package helps to set the S apart from the base FTR 1200. Indian Motorcycles photo. The S also gets an upgraded electronics suite, which is immediately noticeable by the 4.3-inch, Ride Command LCD touchscreen display that replaces the analog dash of the base FTR. Bluetooth is built in, as is a USB port for charging your smart phone (a USB port is found on the base version as well). Once paired, riders can control their phone and music right from the bike’s dash. The display also allows riders to access additional electronic features not available on the base model. For starters, the S version allows riders to disable ABS, a feature not available on the standard FTR. An inertial measurement unit is also added, which means the ABS system can sense the bikes lean angle and adjust appropriately. The IMU also affects stability and traction control, as well as a wheelie mitigation system, all of which are exclusive to the S version. Not only does the FTR 1200 S add in a slew of cool technology, it also allows you to turn it all off. Indian Motorcycles photo. In addition, the S features three unique ride modes: Rain, Standard, and Sport. Each mode will feature a distinct throttle response along with varying levels of intervention from the traction control system. The FTR 1200 S is available in three different color schemes. Indian Motorcycles photo. The additional features of the S version bump the price by two grand over the standard FTR 1200 for an MSRP of $14,999 with two colors to choose from: Indian Motorcycle Red over Steel Gray or Titanium Metallic over Thunder Black Pearl. For an additional $1,000 you can opt for the Race Replica paint scheme. Before you scoff at the additional price for the paint, I’ll remind you of the Yamaha XSR900. The yellow bumblebee race-block paint job was an additional $500 over the stock silver version. Those bikes are now bringing a premium far in excess of the original $500 difference when they show up on the used market (if they show up at all). I think Indian should be commended for building this bike. It is big step away from their current demographic and introduces an American-made, mass-produced (sorry Motus and Buell), performance-oriented bike to the market. Harley-Davidson, for all their efforts, has yet to offer a real performance-oriented sport machine. I look at the new FTR 1200 and I see a retro-inspired, naked sport bike. It’s what the Triumph Thruxton is to café racers, or what the Ducati Scrambler Desert Sled is to scramblers. It’s an American-made version of a BMW R nineT or Yamaha XSR900. Well, that last one might be a bit of a stretch. I mean, the FTR does have a rather long wheelbase and it’s not featuring 17-inch wheels. But still, show me anything in Harley’s lineup that has even come close to delivering this level of sport performance. So, what’s my point? Retros sell. Nakeds sell. And not just in America, but around the world. And as the American market continues to shrink in comparison to the rest of the world, manufacturers need to take into account what is selling on a global scale. This is the first of the new Indians that I am genuinely excited to ride. Now all that’s left is to do is for me to convince Indian to send the key directly to me so I don't have to try to wrestle it away from Lemmy.